Ash borer is technically known as the lilac borer, Podosesia syringae, though severe damage in Iowa is more common on young ash trees than on lilac shrubs. This insect also will feed on privet and mountain ash. What is unusual about the ash/lilac borer adult is that they are day-flying moths and they mimic common paper wasps in color, size, shape, and flight habits. The moth does not have typical scales like most moths, and are therefore called "clearwing" moths. The forewings are smoky brown and the hind wings are clear with a dark border. Overall wingspan is 1 to 1 1/2 inches. Larvae are creamy white with a brown head, have three pairs of segmented legs and several pairs of fleshy prolegs, and are 1 inch long when full grown. 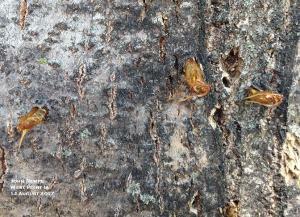 Ash borer moths emerge in mid–May and lay eggs on the rough bark or near trunk wounds of the host plants. Tiny, newly–hatched larvae tunnel into the tree or shrub and feed for a while beneath the bark. Later, they tunnel deeper into the sapwood and spend one year feeding and growing inside the host. The full-grown caterpillar chews an opening to the outside before transforming to a pupa. New moths emerge from these pupae, leaving behind the brown, brittle, empty pupal cases protruding from the host branches or trunks. Most borer infestations occur in the lower portion of the host, from the soil line up to 3 feet high. Ash trees are commonly attacked when they are small, and infestations in trees greater than 6 inches in diameter are rare. Structural damage caused by the borers weakens the trees that often break during storms. Small, heavily attacked trees may be killed outright. Larger lilac stems are attacked. Swollen unsightly areas on stems indicate the site of borer activity. Minimizing tree stress and injury, especially in young host plants is the best prevention for these borers. The least amount of damage occurs to healthy, vigorous trees or shrubs planted in an appropriate site and maintained by mulching, watering and other proper cultural measures. Tree wraps on young trees may or may not influence ash borers. Tree wraps on newly transplanted trees are recommended from late fall through early spring, but continued use through the summer is of unlikely benefit. Insecticide sprays can prevent lilac/ash borer attack, but sprays do not control borers already inside the plants. Spray treatments must be applied to coincide with the hatch of the eggs laid on the hosts. On the average this is early to mid–May. Unless ash/lilac borer pheromone traps are being used to monitor moth flights (typically used by commercial nurseries, only) spray in early May when Vanhoutte spirea (bridal wreath) is in full bloom or when lilacs are just finishing bloom and again 3 weeks later. Should I treat my ash trees to protect them from emerald ash borers?